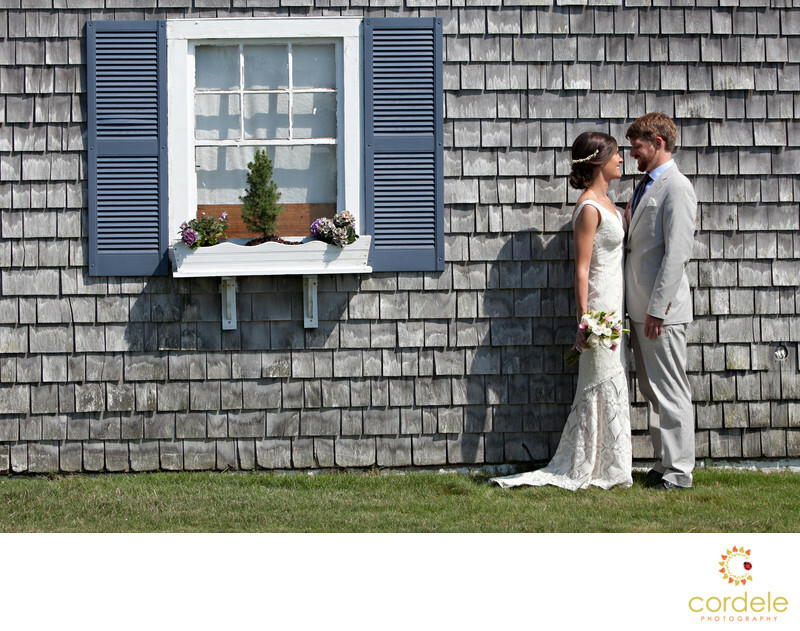 This wedding was taken at a private residence in Yarmouth MA. The bride rented the house from a sweet lady that opened her home to the bride and groom and their family for the day. They set up a tent in her side yard over looking Lewis Bay in Hyannis. They had a spectacular day with bright sunshine and a light breeze. When hosting an outdoor wedding you have to think about what the sun and wind will be doing. I was photographing the bride and groom with the ocean in the background, but the sun was in the wrong spot. I took a few minutes to walk around saw the window with the flower box. The light blue shudders are very much a cape cod feel. Light and weathered. I just had the bride and groom stand and didn't worry too much about the bright sun. I knew this was more of an environmental wedding photo to show the location feel, than a portrait where their faces were important. Shooting on the Cape is one of my favorite places. I spent my summers down there in Dennis and love going down there to shoot intimate weddings.